I was out walking with CC yesterday, when we were approached by Stephanie Squier, a photographer. She wants to do a photoshoot of CC for free… she’ll give me the photos for personal use, then make the proofs available for sale as stock photos. We decided to wait a little while while we complete her Therapy Dog status, at which time she’ll be able to wear the special vest & patches signifying her status. Both Stephanie and I think that this would be a good photo for the portfolio. Talk about a good life: CC is truly living the California dream. Is this the beginning of her modeling career… what next, movies? I have to confess my guilty pleasure: I love In-N-Out. I typically order a #2, with onions, sometimes upgrading to a chocolate shake. My mouth starts watering as I wait for those first, scalding-hot fries. These fries are the best. I swear that they must put crack in the oil. This is the only burger where I’ll eat the tomato. The wax-paper wrapper is a godsend, keeping all the juiciness in tact. And I laugh when my breath is fierce after the onion overdose! Love it. I avoid other fast food joints just so that I can save up the calories and lifetime allotment of transfats for In-N-Out. I can go about a fortnight, but then the irresitable craving, the hunger sneaks up on me. I’m not going to pretend that it’s healthy, but I really don’t care. No… I’m not getting paid for this endorsement. It’s heartfelt. If you haven’t had the opportunity to visit one of these restaurants in CA, Nevada, Utah, or Arizona…. you really ought to put it on the list of “to-do’s” on your next trip. Look, there are better burgers to be had, but I’ve honestly never eaten at a better fast food joint. 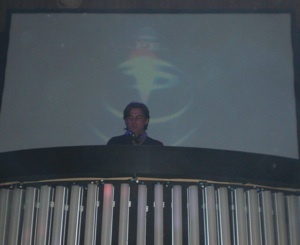 Last Saturday, I went to see Paul Oakenfold’s Perfecto show at the Rain nightclub/venue in Las Vegas. It was a great show! In addition to him spinning some great music, there’s a really cool Cirque-du-Soleil type acrobats performing above the dance floor without a net. Here are 2 photos. More photos are located in my smugmug gallery for the Vegas trip. You are currently browsing the Lura.net Blog archives for September, 2009.